Jim’s been here almost 3 weeks, and I’ve been here 1 week now. We got our monthly newsletter sent out today so we figured it’s about time we saw some sights. Pretty impressive place. Although they have plenty of horse-racing in the Spring and Fall. It’s all about The Greatest Race! A tradition since 1875 – the running of a 2-minute race! See this year’s Kentucky Derby video. We signed up for the ‘Behind the Scenes’ tour. First stop – the jockeys’ locker room and their ‘Silk’ room. These are all the shirts that the jockeys wear representing the owners of the horses. This is how they fly the owners’ colors. Pretty bright room eh? Here are the signature Twin Spires. And here’s a panorama of the track. Click it to see a larger image .. then use your Back button to return. Louisville Slugger Ever since Lynne and John went to the Louisville Slugger factory, Jim has wanted a bat engraved with Geeks on Tour. Pretty cool huh? The number of tourists at the Louisville Slugger factory was astounding! Tours of the factory left every 5 minutes and had at least 25 people in each. Did you know that a major league hitter can go thru 120 bats in one season?! There was a "rush" order on the production line for Florida Marlins short stop Hanley Ramirez. It was an interesting neighborhood too. Did you see the Forbes.com article? Between the heat and the airplane flights from Louisville, KY to Fort Lauderdale and back, I’ve been a little out of touch. Jim picked up the slack and wrote a couple of posts here! I think this is the longest I’ve gone without posting – almost 2 weeks. I do use Facebook for quick updates, both business (www.facebook.com/geeksontour) and personal (www.facebook.com/chrisguld.) One of the things I mentioned there is a link to an article on Forbes.com about us entitled “Running a Subscription Website from the Road.” We really like how this article came out and want to be sure we tell you all about it even if you don’t follow us on Facebook. Serendipity. Back in May, just before we left Ft. Lauderdale, I got a notice for a meeting in Boca Raton – just north of us – where the speaker was someone I knew and the topic was Camtasia. Camtasia is the software I use for creating our tutorial videos. I love it. They just came out with a new version and that is what was going to be demonstrated at this meeting. I jumped at the chance to attend. It was good to reconnect with the speaker, and then, after the meeting, the guy next to me started asking all sorts of questions about how I use Camtasia and what our business was and how we operate. Turns out his name is David Carr and he’s a freelance writer who has a commitment to Forbes.com. He thought we’d make an interesting story and he made an appointment to visit us at the RV before we left to follow up and take a few photos. You never know how an article is going to come out, but we really like this one. It’s the first time anyone has focused on the business part of our lifestyle. Check it out and tell us what you think. Actually, tell Forbes readers … there is a place for comments at the bottom and I don’t see any so far. You could be the first! Today we celebrate fatherhood, paternal bonds, and the influence of fathers in society. I celebrate my Dad today. I hope he gets his favorite breakfast of bagels, Nova and cream cheese. If I were there, I’d fix it for him. My sister will be there this afternoon and Chris will be there as my surrogate, but it’s not the same. They won’t enjoy sitting (and snoozing) in the living room, watching the Marlins game. A win would be nice. As a lucky father myself, I’ll just take it easy today. Jim here. I’m batching it for a couple of weeks in Kentucky while Chris is in Florida. I have plenty to keep me busy. She left a nice honey do list. Chris is trying to spend quality time with her mom, visiting friends and shuttling my dad to his various appointments, so she is much too busy to post to the blog. One of the best things about this lifestyle is meeting new and intersting people. Often, they become your neighbor for a short time, then they are on their way. New neighbors pulled in the other day with cool graphics on their 5th wheel, including a web address. 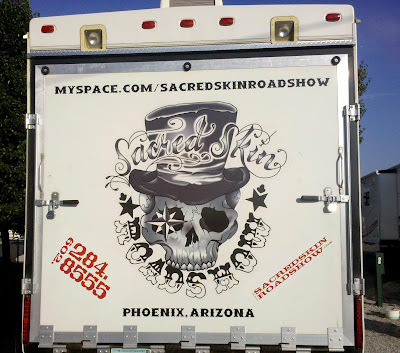 http://www.sacredskinroadshow.com/. I’m always intrigued by that kind of advertising, and promptly visited their website. 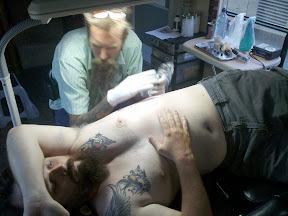 Turns out, their 5er is a Traveling Custom Tattoo Studio. When I introduced myself, they were unloading a couple of bikes to clear their workspace. Here is a pic of the 1950 Harley Davidson Panhead and ‘96 Sportster. LongJon and wife Pinky are in their second year RVing. They sold the studio in Phoenix after 11 years in business there. LongJon was a writer for motorcycle and tattoo magazines when he apprenticed with a master artist in Tennessee some 16 years ago. Pinky was an aspiring artist and wanted to learn the tattoo trade. She presented her artwork and asked LongJon for an apprenticeship. I visited with them last night at their rig and got to see them at work. 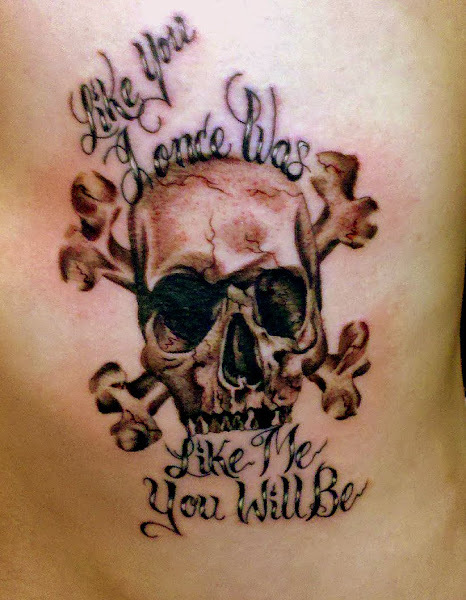 A local couple from Louisville who had been following the Roadshow on the web, contacted them and arranged for some tattoos. 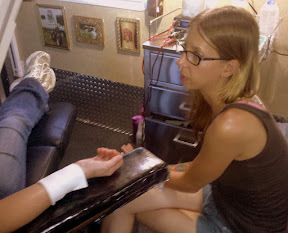 Pinky was just finishing up an arm tattoo on Jena and LJ was busy with Eric’s larger artwork. They graciously allowed pictures and comfortably chatted while art happened. Eric has several tattoos and said LongJon has a nice light touch. We talked about working on the road and particularly the knowledge and sanitary requirements unique to their line of work. I was impressed with their professionalism and style. 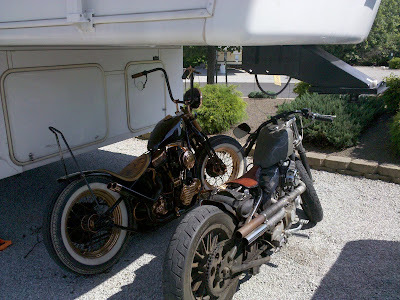 They left today for a bike rally in Rockingham, NC then they travel out to Montana. They expect to log 14K miles this season doing 5 or 6 major gigs and several private events. If you happen to see them in your travels, be sure to say Hi from the Geeks. Our last stop was Louisville, KY. 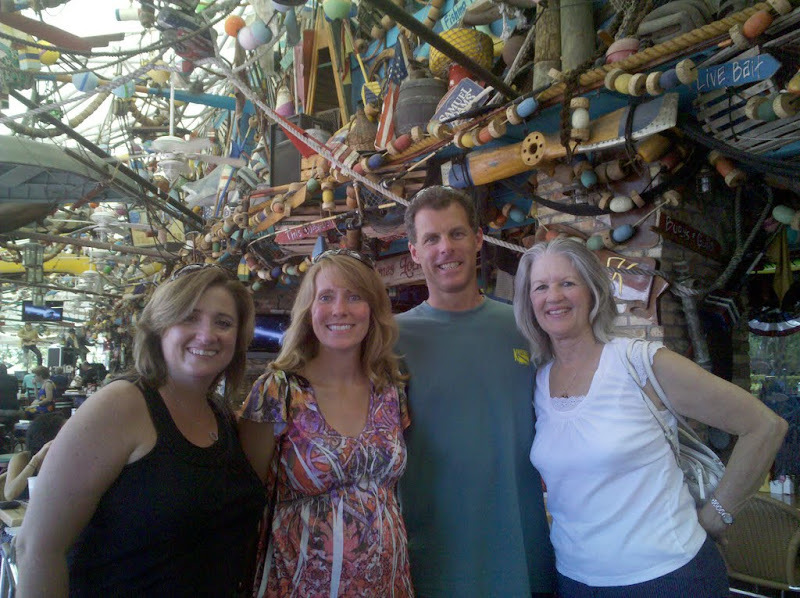 Mom made fast friends with the locals, then we said our goodbyes to Jim and Odie. We had planned this first leg of our summer that Mom would come with us for the first 3 weeks, then I”d spend a couple weeks with her. So I flew back to Fort Lauderdale with Mom, leaving Jim to be a bachelor in Louisville. 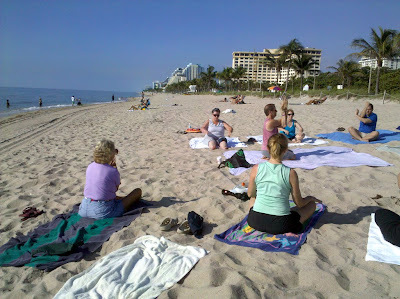 This morning we went to a yoga class on the beach. Can you see that calm wonderful ocean? You can bet if Jim had been here, we would have been diving! Then we had lunch with friends – the main reason being that Diane and Andy were in town to share with us all that they’re going to have a baby! This was quite unexpected news – but we all know they’ll be wonderful parents – especially if being fit is a factor in good parenting! That’s Diane in the yoga picture with the green shirt. She had already run and biked before yoga – I was barely able to get up in time to make it! Andy was swimming a mile in the ocean while we were yoga’ing. See more about Diane and Andy at their blog but be warned – you’ll get tired just reading about all their activities! If you want to try to keep up with them, you might need some of the products that they sell on their Rolling Sands Harmony website. Mostly Yoga and Pilates items. No, you won’t get a discount by mentioning the Geeks, but we know you’ll get quality products and be sending your money to really good people. Mammoth Caves is only about an hour north of Bowling Green and we wanted to do something fun with Mom before sending her back home. The last time we were here we took the tour starting at the Natural or Historic Entrance. So we signed up for the $12 ‘New Entrance’ tour. I’m glad we did. This tour goes thru a part of the cave that is wet – so there are Stalactites and Stalagmites and Flowstone. I always remember which are StalaCtites and which are StalaGmites because of the C and G. C means they come down from the Ceiling and G means they come up from the Ground. It’s a long, steep, narrow stairway going down into the cave from the New Entrance. Cool. Spooky. Actually, it’s really cool – 54 degrees, compared to about 84 outside. I think Mom liked it. It reminded us of when she arranged for all of us to go to Yucatan and get a special scuba diving certification for Caverns. That really must go down as one of the most unique, spectacular, experiences of my life. Diving in the gin clear fresh water and floating by submerged stalactites and stalagmites. Too bad I can’t go back and look at a blog post of that experience but that was in the 90s – BB (before Blog) The caverns are knows as ‘Cenotes’ and here are a few pictures on the Cenote Dive Center site. The camera lens fogged up when we came out of the 54 degrees into the 84 and high humidity. After the tour, we could take a walk by ourselves just to view the entrance at the Natural or Historic site. I’ve been following information on the RV.net website since before we started RVing. The forums are an incredible wealth of information. You can ask a question and, within an hour, you will have several answers. 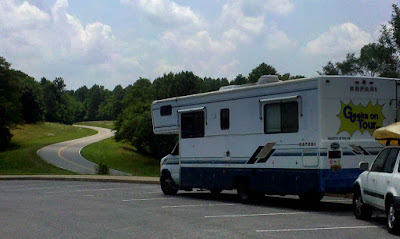 So, in late 2007, when I saw a call for Bloggers to write for a new RV.net Blog – I jumped on it and filled out all the information, including a link to this personal blog so they could see that I write for the long run. A month or so later I got a phone call from Leslie saying that I had been chosen as their Blogger on Computer issues for the RV.net blog. I have never been so excited over news that I had years worth of work to do … with no pay! It’s amazing what we will do for recognition! That was 2 1/2 years ago now and with rare exceptions, I’ve written an article for them every single week. I love the fact that the obligation makes me come up with something to say about computers and traveling every week. I also love that my articles are seen by many thousands more people because of RV.net’s following. I keep a list of all the articles on our website. Last year, we got to meet Leslie and David in person at The Rally in Albuquerque. Yesterday we got to visit them in their Affinity offices in downtown Bowling Green. Good people – we enjoy being affiliated with them and look forward to The Rally this year in Louisville. The focus at this conference is similar to the old ‘Life on Wheels’ where it was all about learning the details of living in an RV – from understanding the bathroom holding tanks, electrical systems, and propane appliances, to fire safety, state laws of the road, and RVing clubs. We attended Life on Wheels in our first year on the road. The program was over last year with the death of it’s founder, Gaylord Maxwell. We were thrilled to be included in this new incarnation of the program. Thanks to Walter Cannon for inviting us to be a part of it! The best part of being involved in these events is the other people you meet. We’ve run into Dennis and Carol Hill of RV Driving School before, but this time we got to spend some quality time and so enjoyed them. We’ve added their Blog to our list at the right … check it out. We’re flabbergasted! This is a metropolitan area and yet, we have NO Verizon data service. The voice part works fine – we’re in an ‘Extended Network’ area. No roaming charges, and phone calls work just fine. Verizon has agreements to use other company towers. This is a good AT&T area. I even called Verizon thinking there must be some mistake – there must be a setting in our Droids that I need to change? Nope, the rep confirmed … there is no Verizon data service in Bowling Green. OK, well you learn something new every day – luckily there is Wi-Fi in this park, not the best, but it does work. Then … we started talking to someone at the conference who was using a Verizon My-Fi and they had a data connection just fine?!? I posted another ‘Gabbing with the Geeks’ coming to you from the RV LIfestyle and Safety Conference which started today. If you watch it, you’ll learn about RVs in China and Workamping for Amazon. What a beautiful stretch of road. 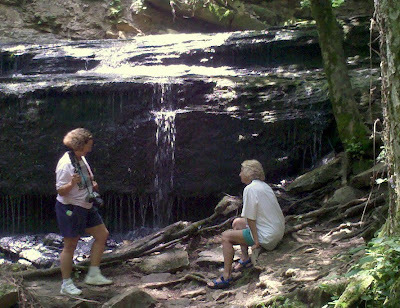 The Natchez Trace Parkway is a National Park – like the Blue Ridge Parkway. No civilization, just beautiful, curving 2-lane road and green, green grass and trees alongside. The road stretches 444 miles from the Gulf Coast of Mississippi, thru Alabama and on to Nashville, Tennessee. It follows a route that has been used by soldiers in the Civil War, and by many generations of Native Americans before them. There are plenty of pullout spots to stop for lunch. Or to take a walk. Jackson Falls was so pretty.